To all the women out there, this painting is dedicated to you. Pre-order prints by inquiring here. As a response to wanting to create something powerful, impactful and authentic, ‘Light & Free’ was born. I wanted to a create a painting that focused on the energy within a woman, her light, her glow, movement and so much more. I don’t want to go too deep into my interpretation of the piece and instead would like you to take a moment to feel and experience this painting and why it might resonate with you. I hope you can feel the passion, love and energy being evoked in this piece. Work in progress shot right before finishing up the final details. How does it make you feel? Do you resonate with it? Drop any comments below. I would love to know what impact this piece had on you. I have the pleasure of sharing a collaboration inspired by this painting with you. 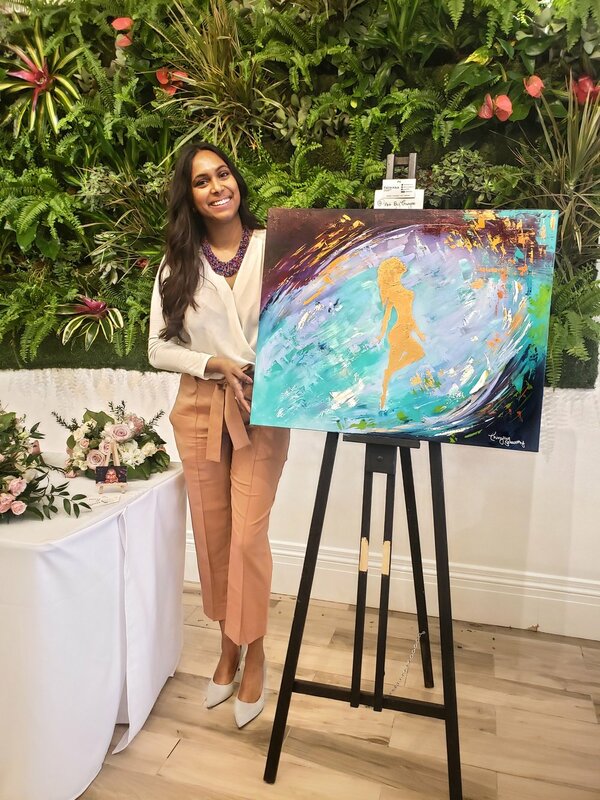 My dear friend and talented Poet, Manivillie Kanagasabapathy also known as ‘My Poetic Heart’ created two beautiful and powerful poems to compliment this painting. Please take a moment to read her poems. Her caption she shared with this poem really stuck with me. ‘Women have always been a part of the divine and story of the universe, we are a part of creation - we are good, nurturing, caring and strong but we are also bad, selfish, imperfect, and weak. In other words we are perfect as we are. As history has tried to erase every version of us but the idealized mold, it is important to remember that we were part of the original story. ‘ Can I get a mic drop please? This was just the caption to her post on Instagram. As soon as I knew I wanted to create a female empowered piece, I knew I wanted to have my favourite poet with me to share it with the world. This collaboration was special for both of us for its own reason. For me, this painting was created in response to wanting more genuine and authentic energy around me. I wanted to focus solely on the feeling of freedom, vibrancy, flow and light in this woman inspired piece. Not the resistance of being a woman in society, or the courage it takes to be a woman. I wanted to create a painting just about self love, the beauty of being just you and that’s it. The simplicity in that fact. Just being an incredible woman and radiating as is. I wanted to do my part as an artist to bring light and love into our world (seeing it in person is much better than anything else) and on social media. For Manivillie, it was a very different experience. She wrote a few renditions of this piece that was quite different than the two we just shared. She fought with different interpretations and found herself leading to a very specific angle for the poem that was different from what she intended. I loved even watching her go through the journey of writing a poem that was just about the essence of being a brilliant woman. Check her blog post to hear more of why this poem was tough for her create. What is your interpretation of this painting? How does it make you feel? Do you resonate with it? Drop any comments below. I would love to know what impact this piece had on you. Subscribe to my email list to see upcoming exhibits, blog posts, new paintings and more.